Ribbon Cutting at S & S Rock Crushing Inc.
RL Smitherman Nature Gallery features the original wildlife and landscape photography of Robert Smitherman. Framed and sleeved prints are available to purchase in many sizes and formats. Kathy's Kreations has all types of wooden furniture available. Kathy paints, stains, refurbishes, and restores high quality wooden furnishings. She contract refinishes and restores items for individuals also. Other artists selling at the gallery are: Heartstrings Creations, J.Shelton's Creations, and Handmade Scarves by Mary. Other small gift items are on hand to purchase as well. 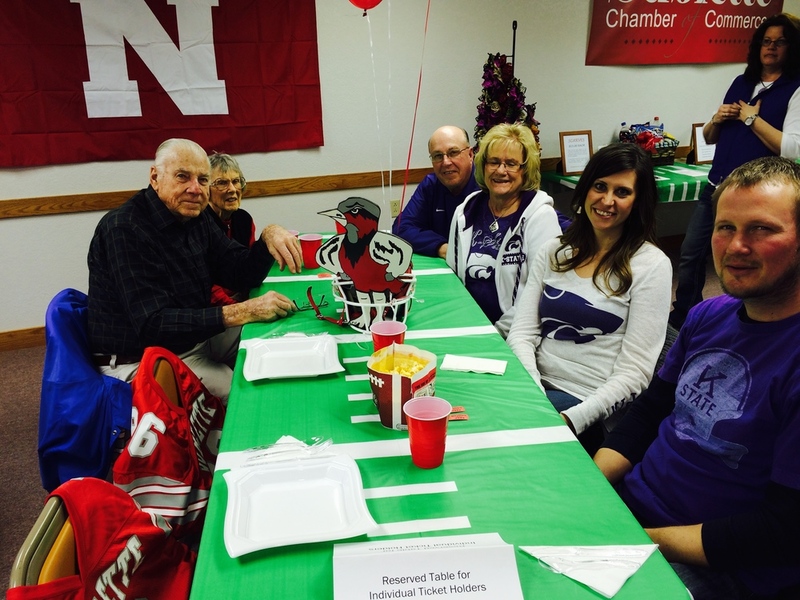 SCoC Annual Banquet 2015 "Celebrate Sublette - Past, Present, Future"
Prizes were awarded to the first, second, and third place winners, who will receive $100/$75/$50 energy credits for Southern Pioneer Electric Co. as well as cash prizes of $100/$75/$50 from the Sublette Chamber of Commerce. A special thank you to everyone who took time to decorate their home this Christmas season. And a very special thank you to the Pride of Life for judging this contest. Also, a BIG thank you to Southern Pioneer Electric Co. for co-sponsoring this event. On Friday, November 14th, the Sublette Elementary School students had the pleasure of inviting “surprise readers” in to their classrooms. Parents and members of the Sublette Chamber of Commerce, as well 8th grade students, visited the elementary school to read-aloud to the students. Many readers brought in their favorite books from when they were a child to share. 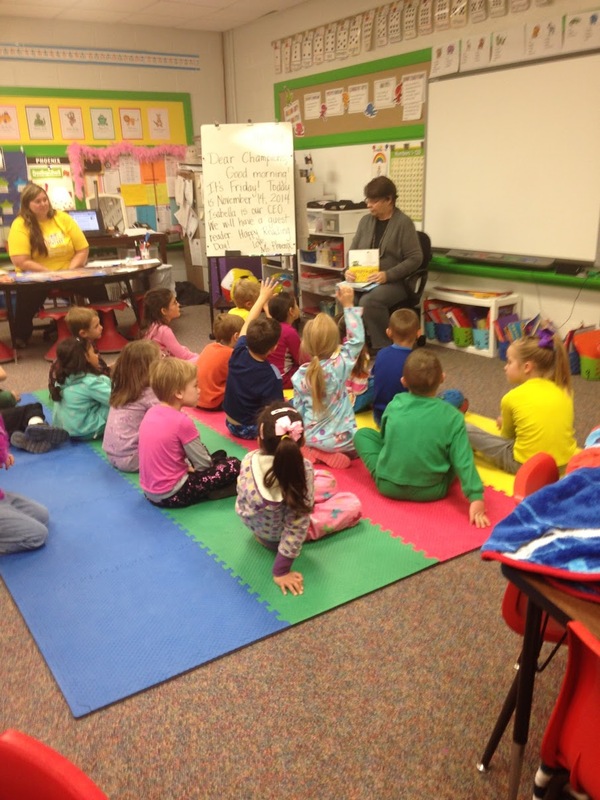 Students also had the opportunity to wear their pajamas and read throughout the day in their classrooms. This day marks the end of National Young Readers Week for 2014. Syngenta proudly announces that it is partnering with John & Rhonda Jury in Sublette, KS to deliver seed solutions to growers that include high-yielding Golden Harvest® brand corn, Enogen Corn, and NK® brand soybeans, as well as innovative trait technologies like the Agrisure® family of traits and proprietary seed treatments. JRJ Agri will offer Golden Harvest corn hybrid, ENOGEN corn hybrids, and NK soybean varieties that deliver proven performance to meet the needs of growers and the changing ways they produce crops. As a Syngenta Seed Advisor, JRJ Agri is committed to helping farmers grow more corn and soybeans. On Tuesday, October 7th, 2014 the Sublette Chamber of Commerce had a Ribbon Cutting Ceremony for JRJ Agri. This Grand Opening event was held at their new warehouse facility at 800 West Lalande Ave. in Sublette. John and Rhonda Jury can be reached at their offices at 109 S. Inman or by calling 620-271-4483. A SCoC Ribbon Cutting took place on September 25, 2014 for the newly purchased Blossom Boutique. Hometown girl Steffanie McAllister is the new owner and creator-in-chief of the flower shop. This business of 40-plus years has been owned by many creative hands and has been a vital part of the Sublette community. Steffanie will provide beautiful floral arrangements, and will also focus on seasonal decorations, tuxedos, and many items full of school spirit. The Blossom Boutique is located at 105 S. Inman Street next to Venture Foods and can be reached at 620-675-8236. They are open Monday through Friday 9:00 -5:30pm. The Sublette Chamber of Commerce celebrated the grand opening of K & K Water Wells, LLC with a Ribbon Cutting Ceremony on Tuesday, September 16, 2014. K & K Water Well, LLC is a full service water well company specializing in test hole drilling and pump maintenance. Roger Kelman and Mike Knehans are Co-Owners with Mike as the General Manager and Chris Marshall as the Office Manager. K & K Water Wells, LLC is located at 710 W. Lalande Ave. in Sublette Kansas. They can be reached at 620-675-2222. Haskell County Animal Hospital in conjunction with the Sublette Chamber of Commerce hosted a "Meet and Greet" for Dr. Becky Leggett, a new Veterinarian at HCAH. Dr. Becky started working at the Haskell County Animal Hospital when she was 15, working after school, during break, and during the summer. Dr. Becky was raised in Satanta and attended the University of Missouri’s school of veterinary medicine. The Haskell County Animal Hospital’s hours of operation are 8:00-12:00 and 1:00-5:00 Monday through Friday and is located 1.5 miles east of Sublette on Highway 56. We are a full service veterinary hospital for all animals, plus boarding for cats and dogs, Science Diet pet food and emergency services. Haskell County Animal Hospital is owned by Dr. Bill and Debra Hessman. On Wednesday, August 13, the Sublette Chamber of Commerce held a Ribbon Cutting Ceremony for Main Street Salon. Jim Lozar and Jana Benton of Satanta, Ks recently purchased this business from Nicole Fanning. Jana is a licensed cosmetologist specializing in hair and nails. Also on staff, Sumr Stokes, a licensed cosmetologist and Regan Lowery a licensed nail tech. Main Street Salon provides services in hair design, waxing, nails, and tanning, plus they carry a full line of beauty supplies. They are excited to bring some changes to the business and look forward to meeting people in the community. Drop in sometime and welcome them to Sublette! They can be reached at 620-675-8002. The Sublette Chamber of Commerce is excited to celebrate this new business in our community. Subway is located at 1887 Hwy 83, Sublette, KS. Local dignitaries and representatives gathered in Sublette on Friday afternoon to break ground on the new SWPRSC Conference Center building located at 808 Lark Avenue. The 8,200 sq. ft. building will provide much needed meeting rooms and facilities for educators, presenters and staff. The center will include multiple meeting/conference areas which may be combined with the removal of an expandable wall. The facility will offer an educationally friendly environment with the latest technology. SWPRSC Director Dr. Kelly Gillespie commented “Professional Learning...Innovative Solutions is the mission that drives the work at Southwest Plains Regional Service Center. SWPRSC is dedicated to improving Pre K-16 education and the lives of students by providing quality professional learning to administrators, educators and students. The SWPRSC Conference Center has been a dream for a number of years and with its launch, SWPRSC will be ready to expand our mission and continue to our commitment to improving education”. The building was designed by Blaine Davis of Architecture Plus of Garden City. Lee Construction, Inc. of Garden City will be the General Contractor. The building is set to be completed by mid-December, 2014. CONGRATULATIONS TO KIM PIANALTO ON THE GRAND OPENING OF DOGGONE BEAUTIFUL! "Where tails are wagging and pets are bragging!" City-Wide Clean Up Day a Huge Success! With over 100 Chamber fans in attendance at its 1st annual banquet, the Sublette Chamber of Commerce ended its year with a BIG WIN! &nbsp;They scored by having a great meal; BBQ by Jerry Miller, side dishes by AFS, and gourmet cupcakes by Marla Webb. &nbsp;During dinner, excitement was building with an intense silent auction. &nbsp;In the last quarter of the evening our auctioneer, Terry Presley, brought the crowd to its feet with a live auction. 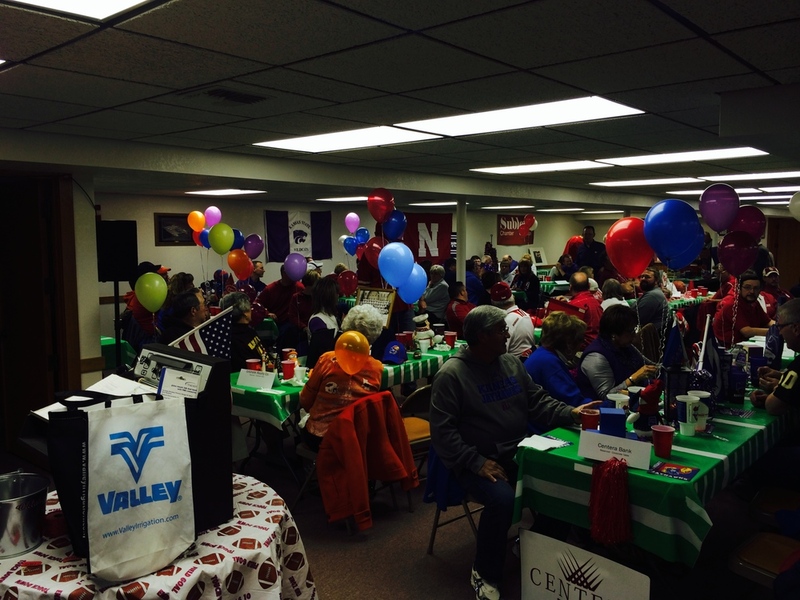 &nbsp;After the numbers were tallied, many prizes were won and a great time was had by all! Ribbon Cutting at U Pump It!